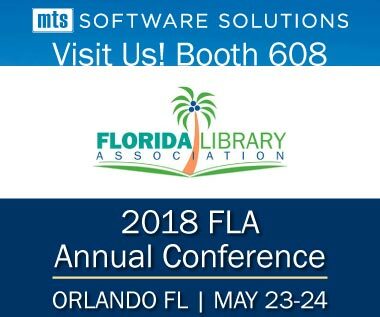 Join MTS Software Solutions at Florida Library Association's (FLA) 2018 Annual Conference - Unleash Your SuperPower! Over 1000 public, academic, and school librarians, trustees, and Friends from the Florida library community will gather at the Caribe Royale in Orlando, Florida. Participate in engaging discussions, thoughtful workshops and presentations, networking and professional development during this three-day conference. In this technology age, conservation supplies now include scanners, computers, printers, networks and software to tie them all together. Eliminating the need to directly handle light sensitive or fragile collections is made possible by digitizing the collection, putting it in a searchable digital database and providing access (paid/free) to that database over a computer network. That's where MTS Software Solutions can help. Learn more about our Library Digitization services. Visit Our Booth #608. Discuss how your library can be digitized with an experienced MTS Software Solutions Information Management Professional. Follow @TweetFLAlibrary on Twitter and search #flacon2018 on Twitter and Instagram for conference updates.